Mmmm Mexican food. It is one of my favorite cuisines- just tonight I was planning on going to yoga, got hungry, and ate a burrito instead. Story of my life. 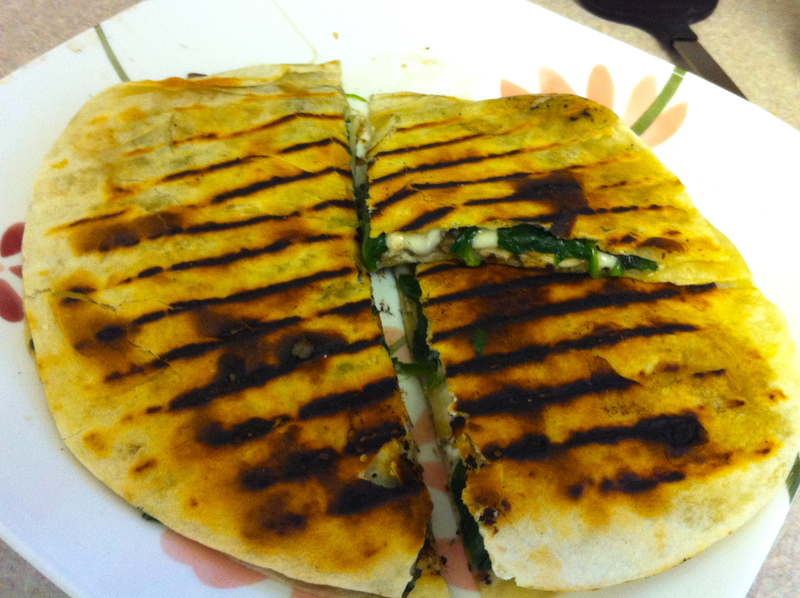 These mushroom and spinach quesadillas with goat cheese are not really Mexican-y, but they do demonstrate how easy quesadillas are to make with a variety of fillings. The main filling is mushrooms cooked with wine and spinach, combined with not one but two types of cheese. They were simple to make and assemble, and I’ve made a few more quesadillas since using leftovers such as the grilled chicken we made over the weekend. I made these particular quesadillas twice in one week to use up all of the ingredients, and altered them slightly the second time to improve them. Fontina cheese was suggested, but I didn’t want to buy yet another type of cheese when I currently have NINE different varieties in my fridge (Yes, nine. I just checked. And that doesn’t include what my roommate has. We may have a slight cheese-obsession). I tried these with mozzarella, but I found the texture to stringy for quesadillas, so I used my cheddar/Gruyere mix the next time which was much better in terms of both texture and flavor. I think any mildly flavored cheddar or non-soft cheese would work just fine. When assembling the quesadillas, just make sure that the non-soft cheese is both the bottom and top layer, as this is what keeps the whole thing from falling apart. I also added some onions and garlic to the veggies the second time around, which greatly upped the interest, and put more wine in the mushrooms. The end result was delicious, and to continue with the Mexican theme look out for a homemade guacamole recipe in the next few days! Melt 2 tablespoons butter in a frying pan or skillet over medium-high heat and add sliced mushrooms, garlic, and onion. Sprinkle with salt and pepper and saute for 2 minutes, then add wine and continue cooking until the liquid has evaporated and mushrooms are brown, another 6-8 minutes. Remove the mix from pan and set aside. Return pan to heat and reduce heat to medium-low. Melt 1 tablespoon butter in pan, and add the spinach. Sprinkle with salt and pepper and cook for about 2 minutes, until spinach has just wilted. Remove and set aside. To assemble the quesadillas, heat a grill pan (or large frying pan), over medium-high heat. 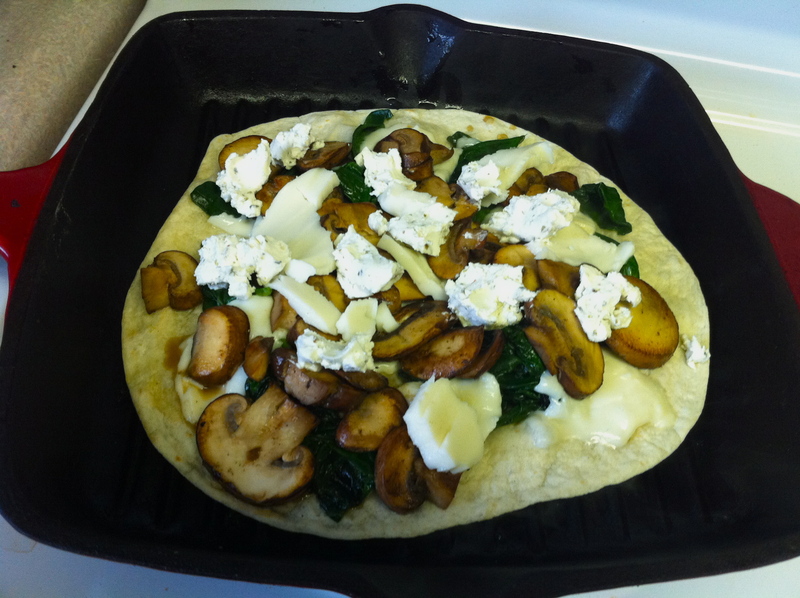 Spread some butter on the grill pan and put the first quesadilla in the pan, followed by 1/2 of the Fontina cheese, then the mushroom mix, then spinach. Crumble some goat cheese over the spinach and finish with the rest of the Fontina. Top with the second quesadilla and smear butter on top, then flip and cook the other side. When both sides are golden brown with some grill marks remove and cut into four pieces with a pizza cutter or knife. Serve with salsa if desired. The Spice household has gone away to the mountains in Virginia for Easter weekend, and while other members of the family have productive things to do (sorry Gina, that 25 pg essay you’re writing next to me looks fascinating), I decided to use this time and my parent’s food budget to make delicious things for all of us. I wanted to make a large dish that I usually wouldn’t make for myself, and following the success of my vegetable lasagna decided to go the baked-pasta/lasagna route again. I found this recipe while browsing through one of my idol Ina Garten’s cookbooks, and thought it fit the bill perfectly. Once I saw that Smitten Kitchen has also tried and had great success with this, I was completely sold. To say the lasagna lived up to expectations would be an understatement- it was delicious and the four of us easily polished off the entire thing. 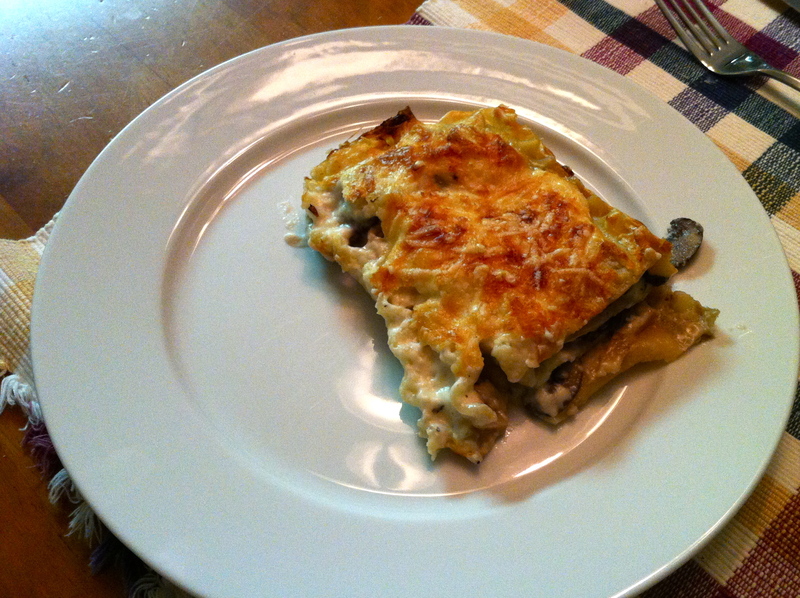 This is simpler than most lasagnas, as the layers are only a bechamel sauce, sauteed mushrooms, and Parmesan, but the simplicity really lets all of the flavors meld together beautifully. The creamy sauce and Parmesan highlight the mushrooms and I didn’t feel like it was missing meat or tomato sauce at all. This took about 2 hours to make start to finish, but only about an hour of preparation before it goes in the oven, and this was without any help chopping or assembling from my dear family. The one complaint I have was that it used quite a few pots and pans for something that seems so simple- this was mainly because Ina suggests you heat the milk before making the bechamel, which adds a step but is probably necessary when making such a large quantity of sauce. I added a clove of garlic as per Smitten Kitchen’s suggestion and did a mixture of cremini and portobello mushrooms, but otherwise kept the recipe intact. Preheat the oven to 375 (I waited to do this until after the noodles were cooked and bechamel started). Bring a large pot of water to boil, with some salt and oil. Add the noodles and cook for 10 minutes. Drain and set aside- if you feel they are going to stick a lot drizzle a bit more oil on them once drained. Make the bechamel/white sauce: Bring milk and garlic to a simmer in a saucepan or heat in the microwave. Melt one stick of butter in a large pot (I reused the pot the noodles cooked in). When the foam from the butter has subsided, add the flour over low heat, and whisk constantly for about a minute. Start adding the milk into this mixture a little bit at a time. When you add the first bit of milk, the mixture may clump and you will think you have gone wrong. You haven’t. Just keep adding the milk and stirring after each addition until the milk is all added and you have a thick white sauce. Add salt, pepper, and nutmeg, and adjust seasonings to taste. Take off heat and set aside. Prepare mushrooms: Discard the stems of the portobellos and trim stems of creminis. 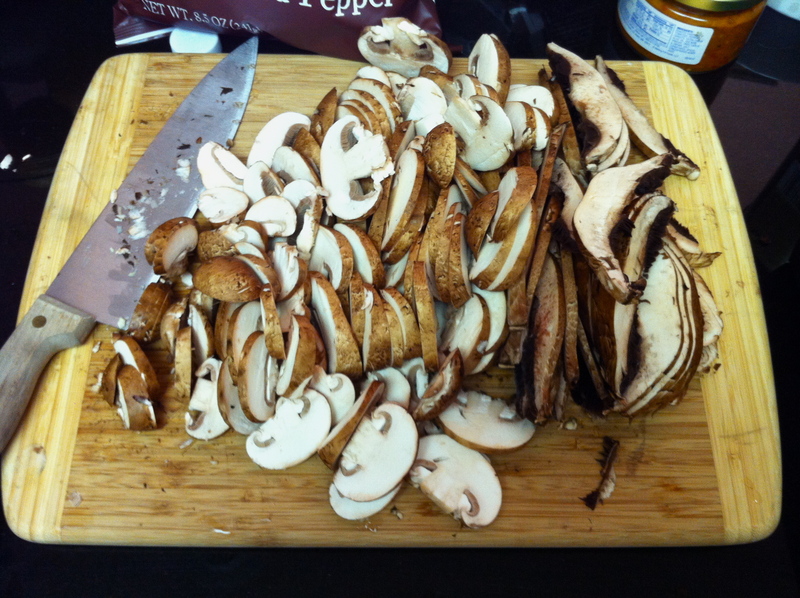 Slice mushrooms into 1/4 inch thick pieces. Heat 2 tablespoons olive oil and 2 tablespoons butter in a frying pan or saucepan, and sautee half of the mushrooms with a pinch of salt for about 5 minutes, until they are releasing some liquid. Remove those mushrooms into a bowl and repeat with 2 more tablespoons olive oil, butter, and remaining mushrooms. To assemble: Spread some sauce in the bottom of your baking dish, followed by a layer of noodles. Then spread 1/4 of remaining sauce on top of noodles, followed by 1/3 of the mushrooms, and 1/4 cup of Parmesan cheese. Repeat this twice. For the final layer, top the noodles with remaining white sauce and another 1/4-1/3 cup Parmesan cheese. Bake for 45 minutes, until top is browned and sauce is bubbling. If you can resist digging in right away, let sit at room temperature for 10-15 minutes. We did not let it rest and it was still excellent.